My motivation for running has finally picked back up after the first real visit from winter this season. As a comfortably warm-natured person for the first eighteen years of my life, I have struggled with the effort it now takes me to achieve and maintain warmth since becoming diabetic. My creativity and motivation wanes in the winter time for outdoor activities, so this year I am exercising at the YMCA and planning for outdoor warmth through layering and the right gear. Later this month I will run the Hot Chocolate 10k and I expect I will need that hot cocoa not only to bring up my blood sugar after 6 miles but also to warm my blood back up. 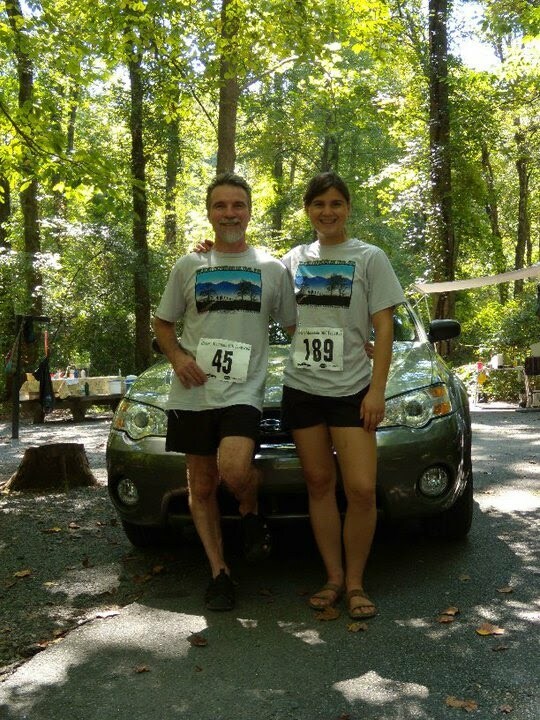 I ran my first (and only so far) 10k this summer with my father who has just become a runner now in his late fifties. It was a trail run through the mountainous Dupont State Forest and the longest distance I’d run before was maybe 4 miles, so I knew I would have to train. This summer I followed the plan suggested by my most fit friend, Alison, running 2 miles one day, 3 the next, then 4, then five. I would rest a day and run 2 again the day after, just about twenty minutes. Sometimes I would throw in some sprint work or hills, although not as much as I probably should have. The day before the race I took a short two mile run through the campsite in Brevard where my parents had a pop-up camper set up for the weekend. I was terrified. My run was slow but my mind raced over the possibilities. What if I get two miles into the woods and my blood sugar plummets? – how do you ask competitive runners for help? – would I even be able to make myself ask? It couldn’t come to that. Well it could have…and if it had I would have had to make my situation known to someone so they could run on to a water station and inform the staff. I’m sure my instincts would have conquered my embarassment. But my anxiety produced sufficient planning to rise over hills and low blood sugar. The morning of the race I awoke to percolating coffee and whole wheat toast with spun honey. I cut my normal dose of insulin in half and packed a banana for the car ride to the race site. Belly in knots, Dad and I stretched before the final line up. I checked my blood sugar…160…a little low to start a 6 mile run with. I ate the banana. Surely that would last me. We lined up, a pack of about 70 runners in the cool, foggy air of a mountain morning. The long grass was dewey and I was eager to get running and warm up my body. The whistle blew, the pack took off. There were old and young, men and women, even a high school track team and some ten year old kids weaving around the taller legs. Mile one and two were shaky, but then I saw a girl down in the trail up ahead. She was with a friend – it was two of the runners from the track team. Her ankle was hurt in someway and the friend would stay with her and help, so I decided to run on to the water station to tell the staff there was a runner injured. It was the motivation I needed to forget about my blood sugar fears and book it. Farther than I thought, I reached the station a mile and half later. I let the staff know and they attended to the downed runner – after the race it seemed like it had been only a twist – and I ran on towards the finish with renewed energy. That energy quickly dissipated in mile four when I met the hill so steep that even the fastest finishing woman later reported that she power walked. There was just no way to run it without gravity taking you back down, so I moved my upper body like I was running and firmly planted my feet with each step. In 0.4 mile it was over though and on the 0.6 steep downhill I let go of the brakes and struggled to keep up with my churning legs as gravity really did rush me down the hill. The last mile was a test of my mantra which had moved from “walking is not an option” to “stopping is not an option.” I ran deliberately, then strongly as I neared a runner about 30 years my senior and another maybe 4 years my junior. I passed the younger runner and tailed the man who was now setting my finishing pace. We both heard shouts and cowbells as we navigated the narrow trail and approaced a blind curve up ahead. I had paced him once but he had overtaken me again and was pulling away. I was letting him go, resolving to finish but not magnificently, when rounding the corner I heard very familiar shouts and then saw my mother standing there, right before the final straightaway, shouting for me to run just like Forrest Gump. I gave her a little shout back and felt myself take off, loving the finish, sailing through the field, forgetting my exhaustion and all the fears I had gone into the race with about blood sugar, about stamina, about making it. The man led me and the young girl behind me by seconds but we all raced through strongly, motivated to better finishing times by the final mile competition. If I’d had wings I would have flown, but instead I just collapsed to a seat on the grass before regaining my strength with a juice bottle waiting for me at the finish line while we watched other runners pushing to the end. Posted on February 8, 2014 February 8, 2014 by thesweetadventurerPosted in TheSweetArchivesTagged 10k, diabetes, motivation, running. Next Next post: Running for Cocoa!